We specialize in Red and Apricot poodles, along with a few other colors such as chocolate, black, cream and possibly parties. We specialize in toys and tiny toys. We strive to maintain an excellent breeding program and give our dogs the best care. We are very selective about the dogs we use in our breeding program. Our pure bred dogs, AKC - American Kennel Club - registered Toy Poodles, are simply outstanding in every way and exemplify the best of their breed standards in conformation, personality and intelligence. It has been a long process and now we have our own closed breeding program. We are proud of the lines we have established for excellent pets and dogs for sale! 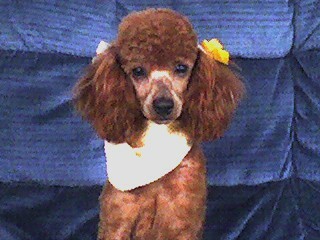 My husband and I are small breeders located in Pontiac, Michigan. We feel that the best dogs to breed should have superior temperment as well as great conformation. This helps ensure that our puppies will be very good natured and lovable.